I recently took a joomchi workshop with Jiyoung Chung. Joomchi is a traditional Korean method of paper making, where mulberry paper is manipulated to create unique textures and shapes. It was a great workshop, and now I am inspired to incorporate joomchi into my jewelry! As the snow melts, my thoughts are of Spring. I've been playing with copper and silver leaf forms, using my favorite hammers, anvils and metal stakes. I'm thinking of incorporating these forms into earrings, pendants and pins. I am preparing for next week's craft show, and inspiration strikes! I inherited some of my grandmother's linens. They aren't in the best condition, but I can use them to line the old wooden drawers I use to display my bracelets. I love the fact that I am using both my mother's and grandmother's fabrics in my display. Thank you, Esther and Margaret! You inspired me then, and now. Just in time for BUST Magazine's Holiday Craftacular on Saturday, December 19th, I have a new line of earrings and pendants, the woven silver collection. BialoPadinDesigns will be a vendor at the Kings County Fiber Festival on Saturday, October 10th, 2015, in Park Slope. The festival will be at the Stone House in Washington Park, 5th Ave and 3rd Street, from 10 am - 6 pm. Spend the day with natural fiber artists, crocheters, dyers, felters, knitters, quilters, spinners and weavers in the second annual fiber fair. The full day event will include a marketplace for independent fiber artists from the tri-state area, demonstrations, an art exhibit and more! If you forgot to make a button hole for that lovely handmade sweater, if your gorgeous shawl keeps slipping off your shoulders, stop by my booth for a solution: handmade shawl pins of many shapes and sizes. Do you want a bracelet that has heft and presence? are you looking for a unique and bold accessory to complement your style? Diamonds, pearls and understated jewelry all have their time and place. Sometimes a delicate chain is just the thing. But there will be days when you want a bracelet that makes you feel strong, powerful, confident and impervious to toxic stares and circumstances. That is when you’ll want to slip on one (or more) of these copper fold-formed cuffs! Claim more space in this world! Step forward and channel your inner superhero! Wear a bracelet that shows the world that you are ready for any challenges that come your way! Aren’t you hot? Wouldn’t you like to get that hair off your neck? Looking for a way to anchor that braid, put up those locks? Looking for something more decorative than those tired hair elastics and ugly plastic clips? You have beautiful hair. You can do better than those plain wooden chopsticks from last night’s Chinese takeout. Did you forget to make button holes for that sweater you just knit? Is it windy? Do you wish you had a pin to stop that kilt from flapping in the breeze? How about that shawl? is it too bulky to tie, does it slip off your shoulders? Maybe you need a pin to hold everything together! So, take that pen out of your hair, and try a handmade hair pin! Use it in your hair, or just stick it in your shawl or sweater. Thanks to the Ridgewood Market, BialoPadinDesigns will be one of the crafts vendors at the Out in the Streets music festival on August 1st, 2015, from 2pm until 10 pm. Out In The Streets takes place on two acres of stunning parkland at the historic Vander Ende-Onderdonk House, 18-20 Flushing Ave, in Ridgewood,Queens. This remarkable site is the oldest Dutch Colonial stone house in New York City. The grounds feature a spectacular view of the Manhattan skyline, as well as lush gardens, a large picnic area, a bonfire pit, and the legendary Arbitration Rock. The large stone sits at the center of the property, historically marking the dividing line between Brooklyn and Queens. This seemingly rural location that lies smack in the middle of the city makes the event a hugely memorable experience. This is a cash only event, but purchases at my booth can also be made with credit cards, until my phone battery dies (hopefully that won't happen), or check. There is an ATM located a block way on Flushing Ave. Bring sunblock, a blanket and bug repellent, and hang out with me.For more information about the music, go to www.outinthestreets.com. For information on other vendors, contact www.ridgewoodmarket.com. BialoPadinDesigns will have a table at this juried craft show, which will be held at Brooklyn Bazaar, 165 Banker Street, Brooklyn, NY, 11 am - 6 pm. Come by and try on our fold-formed bracelets and selection of hair pins/shawl pins. Each bracelet can be adjusted to fit your wrist. 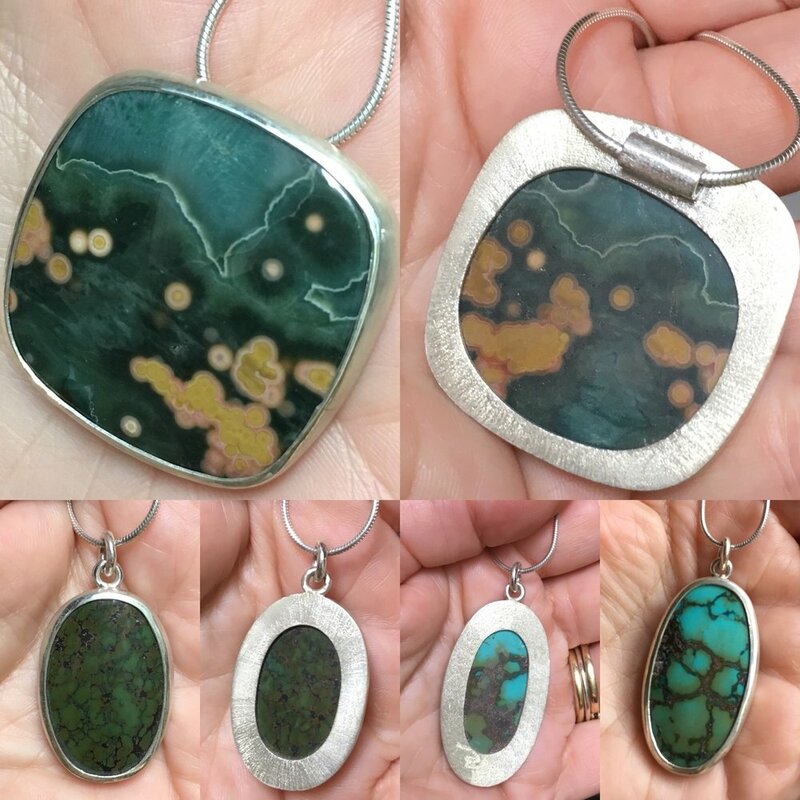 Pendant Challenge, Round # 2: silver, jasper and Chinese turquoise.